I'm sad to report that Bob Sabella died on December 3rd, 2011. This archive of his fanzine will remain on line in his memory. 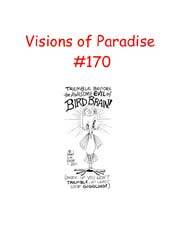 Visions of Paradise began in the early 1970s as an APA-45 zine then, after a 10-year gafiation, returned as a MIShAPzine in the mid-1980s, eventually migrating to FAPA in the 1990s, where it resides now. Prior to issue 122 VoP was a monthly zine with three rotating formats: a personalzine (The Passing Scene), a serconzine (Wondrous Stories), and a letter column (Halycon Days). As of #122, the formats are combined; any or all may appear in each issue.